Instagram is one of the most popular social media networks, with 1 billion monthly active users. Instagram also has powerful advertising tools with the potential to skyrocket your small business’ following and sales. If you’re looking for an affordable way to promote your business and reach more customers, you should consider running Instagram ads. Want great results from Instagram, but don’t have the time to manage a campaign yourself? Reach out to the experts at Hibu and they will create an affordable Instagram advertising campaign specialized for your small business. You can contact them for a free consultation to discuss your business goals and how their services can help you achieve them. If you have an Instagram channel, your posts are typically only seen by users who follow your account. Instagram ads allow you to reach a larger audience and get your business in front of new potential customers. 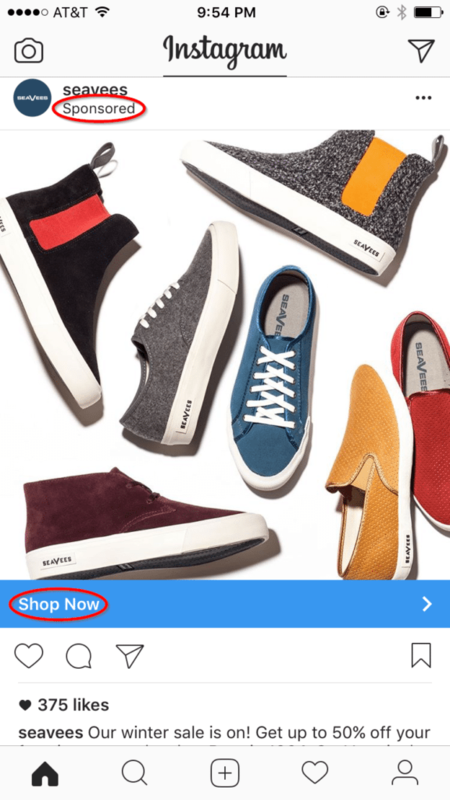 Instagram ads are interspersed in the Feed and Stories section of Instagram and look almost identical to regular posts, with the only tell being the word “Sponsored” on the top left. 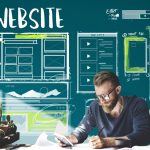 Ads also typically have a banner at the bottom of the image with a call to action like “Learn More,” “Shop Now,” or “Sign Up.” When a user clicks on the banner, they are sent to the webpage you designated for the ad. Before running an ad, you can specify your ad’s objective and target audience. Next, define your ad budget and choose the ad format you’d like to run, including photo and video options. Once the ad is running, you can track your reach and clicks and make adjustments to try to get even better results. Instagram advertising is right for businesses that want to increase their online reach, engagement, and sales. A wide variety of businesses use Instagram ads, from B2Cs selling products to B2B service-based businesses and software companies. Because Instagram is a highly visual platform, businesses with engaging creative tend to get the best results with Instagram ads. Businesses with visual products – If you sell products like clothing and accessories, furniture, or food and drink, Instagram ads are the perfect place to showcase your products to a new audience. Service-based businesses – If you sell anything from landscaping services to marketing consulting, you can use an Instagram ad to introduce your services and tell prospects why you’re the right person for the job. Tech companies – Software companies or tech companies with a hardware product can run video ads to provide a quick product demo. As a fast-growing social media channel with advanced targeting options, high engagement, and proven sales generation, Instagram is a great channel for businesses to invest in. It has the highest engagement rate of any of the major social networks and is estimated to bring in $6.84 billion in mobile advertising revenues in 2018. Define how much you want to spend by setting a daily or lifetime Instagram advertising budget, starting at $5 a day. Your budget is an average daily cost and may vary slightly depending on placement opportunities. Cost is based on impressions, meaning the number of times your ad appears in users’ Instagram Feeds or Stories. Depending on your optimization goal, you can play around in the Advanced Options settings and choose to pay based on link clicks or 10-second video views instead. However, if you’re just starting off, it’s easiest to just set your budget and use the recommended default settings. Once your budget is set, you’re ready to choose your Instagram ads format. Your format options include Single Image, Single Video, Carousel, and Slideshow. You can also choose for your ad placement to be in the Instagram Feed, within Instagram Stories, or both. Single Image ads are the simplest ad format, displaying a single photo related to your product or service. Use the Single Image ad format if you want to share an eye-catching image to promote a specific product, service, or offer. This ad format is best for businesses that are new to Instagram advertising because it is the easiest to set up. Below is an example of a Single Image ad from a watch company called MVMT. 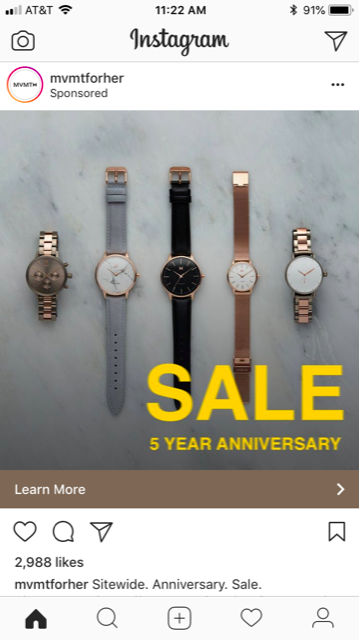 In their Instagram ad, they use one image to display multiple watch styles at once. They also add some text to the image to promote their anniversary sale. Single Video ads are GIFs, or videos, up to 60 seconds in length. Video ads are great if you want to show a product in action or provide a video introduction to explain the value of your services. Video ads also often work well for companies that don’t have a tangible product, like software companies or service-based companies, because you can provide more context that you could with a single image. Here’s an example from food and beverage software company BevSpot. They use their video to give users a walk-through of their product and show multiple features and dashboards. This gives users a much better understanding of what BevSpot has to offer than a static image could provide. Carousel ads are a collection of two or more images or videos. Instagram users can swipe to view your library of photos and videos. Carousel ads are great for businesses with many different products or services to show off. Here’s an example from the online education platform MasterClass. 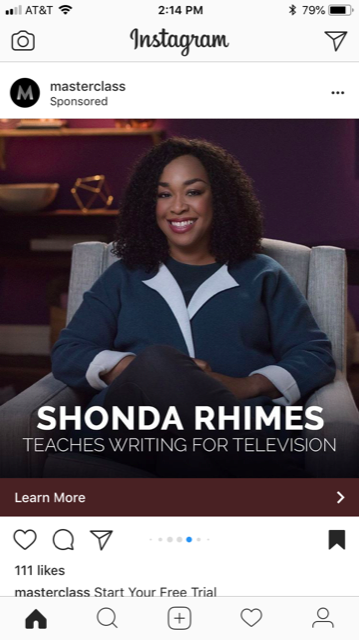 MasterClass uses a Carousel ad to highlight a collection of their online courses. Slideshow ads act like video ads and are made up of as many as 10 images that display on loop. You can upload a collection of images and add music to create an engaging montage. Slideshow ads are the perfect fit for business that don’t have the time or resources to create video content, but want to add some motion and music to pique interest. Stories ads show up within the “Stories” section of Instagram. You can create Single Image or Single Video ads, which can be as long as 15 seconds. Stories are a new and popular Instagram feature with content expiring within 24 hours. If you have a limited-time offer or promotion, a Stories ad will feel timely and have a bit more urgent feel than other Instagram ad types. 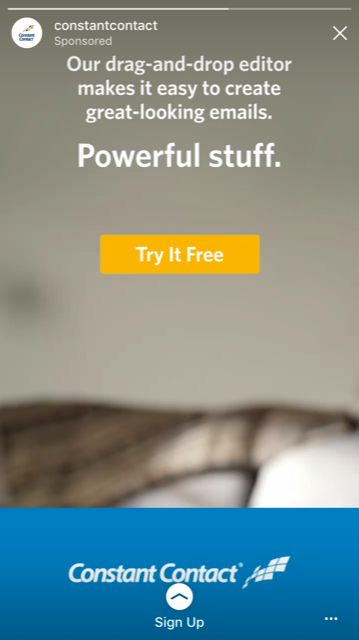 Constant Contact Instagram Story Ad. Because Instagram was acquired by Facebook in 2012, Instagram Ads can be created right within the Facebook Ad Manager. To access Facebook Ad Manager, you’ll just need a Facebook Page for your business. If you don’t have one already, use our how-to guide to create a Facebook Business Page in 6 steps. 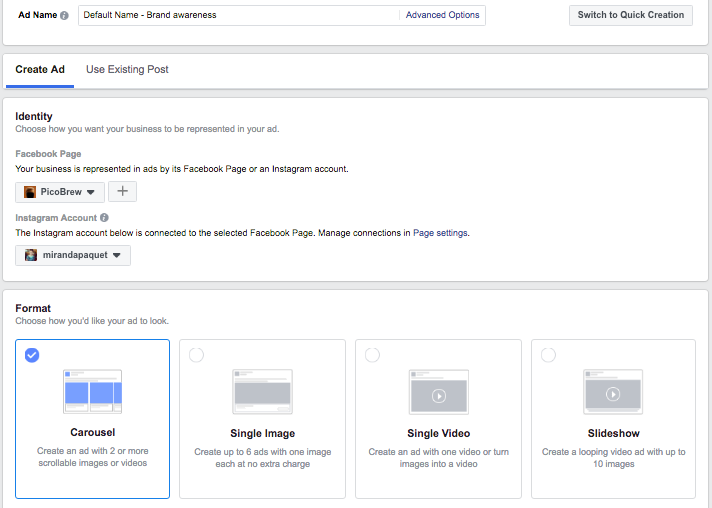 Get started in Facebook Ad Manager by choosing your Instagram advertising objective. Your objective is what you want people to do when they see your ads. Your objective will fall within one of three categories: Awareness, Consideration, or Conversion. Awareness – These objectives create new interest in your product or service, focusing on increasing brand awareness or reach. Consideration – These objectives are meant to get people interested in your products or services and to drive some action. Consideration objectives include increasing website traffic, boosting engagement, and generating leads. Conversion – Conversion-based objectives persuade users who have expressed interest in your business to make a purchase or sign up for a trial. After you choose your marketing objective, you’ll need to define the audience that you want to see your ads. You can refine your audience based on Location, Age, Gender, or Languages. Or, use your existing customers’ contact information to create a Custom or Lookalike Audience. Custom Audience targeting helps you reach people who have already interacted with your business. Custom Audiences are great for driving repeat business and staying in front of your existing audience. Lookalike Audience targeting helps you reach new users who are similar to your existing audience. Use Lookalike Audiences if you want to advertise to Instagram users who are similar to your existing audience. There are also some Detailed Targeting options where you can specify demographics, interests, and behaviors. As you refine your audience more thoroughly, keep an eye on the Audience Size barometer on the right-hand side of the page. Ideally, you want to hit a sweet spot where you can reach a specific audience that is still sizable enough to make an impact. The Placements section is where you specify where you want your ads to appear on Instagram. Select “Edit Placements” and make sure Instagram is checked within the “Platforms” section. You can choose for your ads to appear in the Instagram Feed or Stories, or both. Ads placed in the Instagram Feed are more common since the Feed has been around a lot longer than the Stories section. That said, social media management tool Agorapulse found that their Stories ads had a 44 percent higher reach and 78 percent more clicks. It’s worth experimenting with both placements and seeing which performs better for your business. 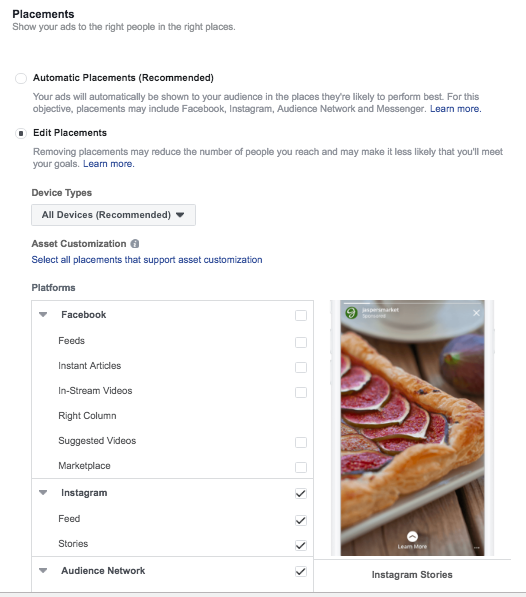 The Placements section also lets you extend your ads to Facebook. Although this might seem like a great way to increase your reach, we recommend that you run different ads on each social media channel so that you’re optimizing for each channel. Check out our ultimate guide to Facebook Advertising if you decide you want to try running ads on Facebook as well. One of the best parts of running Instagram ads is that you can start small ($5/day) and then increase spending once you start seeing what is performing well. 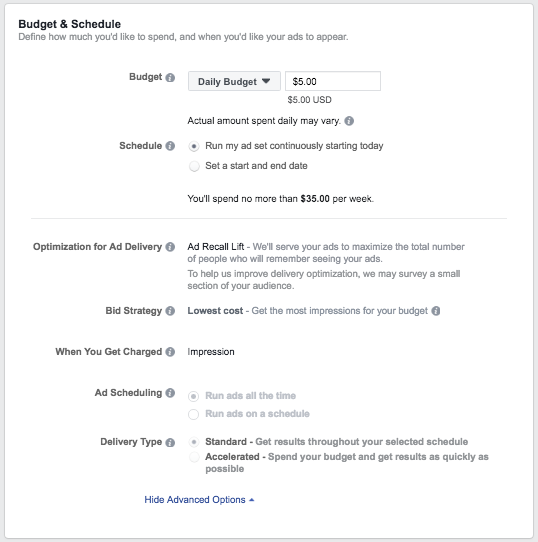 Start by entering a daily budget, which is the average amount of money you’ll spend on ads each day, or a lifetime budget, which is the total amount you’ll spend on your advertising campaign. You can also set your schedule to start immediately and run until you hit your allocated budget. Or, choose a start and end date and time, which is a better option if you’re running a promotion with a clear end date. You want to make sure your ads are timely and you’re not wasting money promoting a special offer that has already expired. Within the “Advanced Options,” you may have some ability to customize your strategy more depending on your advertising objective. Most often, your ad will be optimized to get the most impressions for the lowest cost, so you should not have to change anything here. Now you’re ready to finally create your ad. Start by creating an Ad Name that is specific and recognizable so it will be easy to pick out when you’re reviewing ad performance later on. Make sure you’ve connected the correct Instagram Account so that your ads will be associated with your business’ Instagram account. Next, choose your ad format. Review the “5 Types of Instagram Ads” section of this article if you need a refresher on the different formats. If this is your first Instagram ad, it’s easiest to start with the Single Image ad, which requires just one image. As a visual channel, the images and videos you choose for your ad will be crucial to your success. By choosing the Single Image format, you can create up to six ads with one image each, which will allow you to see which types of images are generating the most engagement. If possible, it’s best to upload high-quality images from your business that show off your products or services. Make sure your images are in line with the recommended image specs. Your image dimensions should be 1200 x 628 pixels and your images should have little or no overlaid text for maximum ad delivery. If you don’t have any images to use, you can choose from a library of free stock images, but these will feel less personalized to your business and might not perform as well. Next, add your ad Text, which is the caption beneath your image. Typically, you want a short and snappy caption with just a sentence or two to promote your product or service. Use the Ad Preview to make sure your entire caption is viewable without getting cut off. 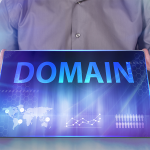 Add your website URL, which is not necessarily your website homepage. For example, if you’re promoting a specific product, you can link to that exact product page to make it as easy for users to take action and make a purchase, if possible. You should also update your call to action, which appears below your image; make it clear what action you want people to take. Your call to action options include Learn More, Contact Us, Shop Now. Take a few moments to review your ad details to make sure your targeting, placement, budget, and campaign details are all correct. Once everything looks good, hit Confirm to publish to your ad. Don’t worry, you can still make edits to your campaign after publishing. 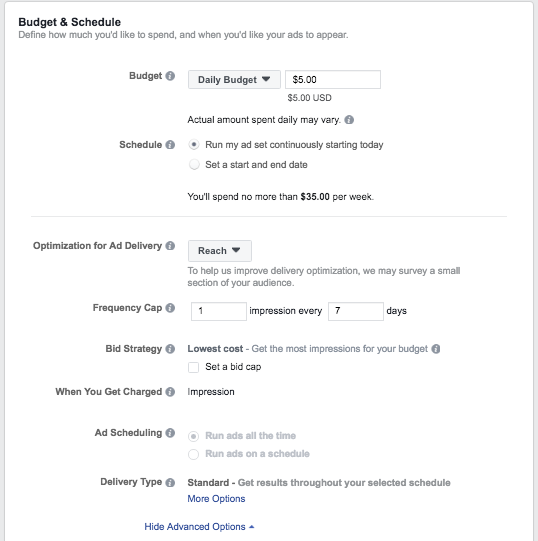 Once you publish your ad, visit the Facebook Ads Manager to track your performance and see how your ads are performing. 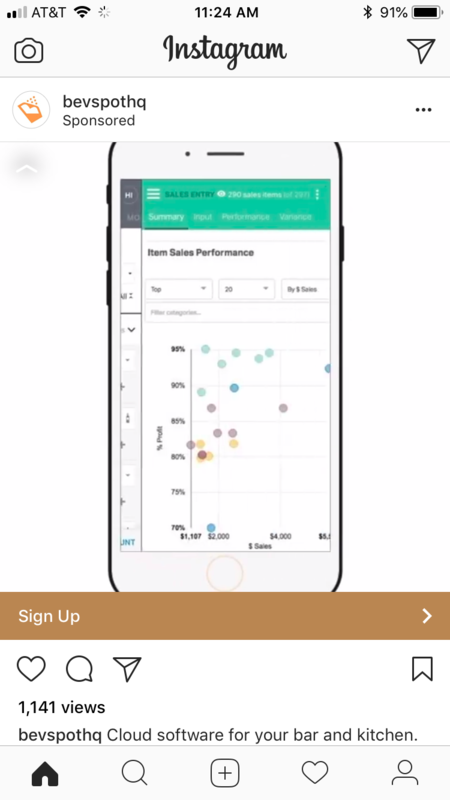 To see Instagram ad metrics, click on the name of your ad campaign, which will take you to the full Performance, Audience, and Placement data. Impressions – This is the number of views that your ad receives. Clicks – This metric is the number of clicks your ad is generating. Cost per result – This is the amount you are paying for a user to take an action, like click on your ad. If your click per result seems high (more than $5), consider changing your ad copy to make it more relevant to your target market. The best way to optimize your Instagram ads is to determine which metric is most important to you based on your advertising objective, experiment with different ad formats, copy, and creative, and then put more money behind the ads that are performing best. Check in with your results on a daily basis. If you have ads that are not performing well, reallocate your budget to put money behind the ads that are performing better. Update your images/videos – Instagram is a highly visual channel, so quality creative is essential. If you don’t have an in-house resource, consider hiring a photographer, video producer, or graphic designer to help your out. Fiverr is a great platform for finding inexpensive design support. Revisit your targeting – Make sure your ad is reaching a relevant audience. 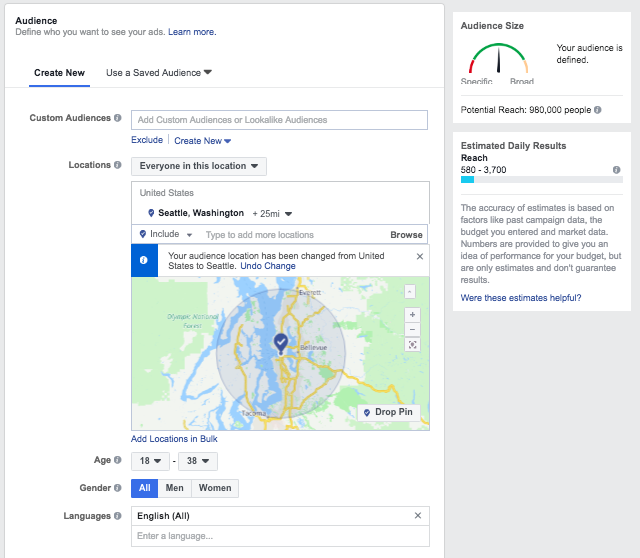 There are a ton of demographic, interest, and behavior refinement options available for your ads, so spend some time digging into these options to see if you can reach an even more relevant audience. Try a different ad placement – Experiment with Feed and Stories placement to see if one performs better for you. Make a more compelling offer – If a user is new to your business, they’ll need something compelling to catch their eye and persuade them to take action. If you’re running a special offer, make sure it’s timely and a great deal. Instagram ads are a fantastic way to get your business in front of new prospects. Spend some time going through the steps to make sure you’re making the most of the advertising features available to you. After you run a couple of ads, you’ll become more familiar with the process and have a better idea of what performs best for you. If you want to try Instagram advertising but don’t want to do everything yourself, reach out to the experts at Hibu. Hibu has Instagram advertising experts who will work with you to create quality ads and optimize them for best results. Visit their website to learn more and schedule a free marketing consultation. Instagram is indeed the best platform to promote visual content currently and the engagement is way higher than many other platforms. 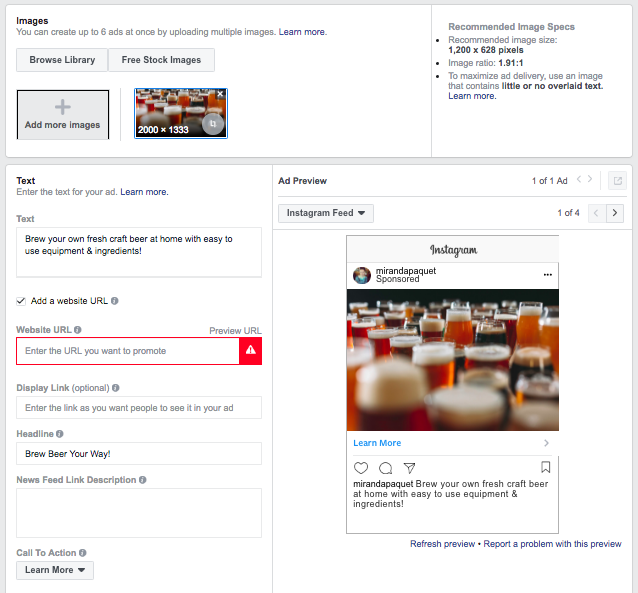 Although Instagram and Facebook use the same platform for advertising, I recommend running separate ads that specifically target either Facebook or Instagram. This will tell you which platform works best for you (and therefore which you should spend more money on) and also you’ll be able to optimize your content accordingly. For me, Facebook has tended to be a less expensive cost per click, but this will definitely depend on your industry and the type of user you’re targeting. It’s still worthwhile to test out both if you have the budget for it. Plus you’ll be able to reach a wider audience if you spread your ads to different platforms. Nice. It’s really informative and useful post. Thank you for sharing great article. Thanks for sharing this informative article on advertising on Instagram. Although social media is a very economical and productive advertising option, most of the people aren’t aware of the right way of advertisement on such platforms. Your article was very detailed and it touched almost all necessary points of advertisement on Instagram. Thanks for commenting, and I’m glad you enjoyed the post!